The gilded altarpiece was made in Antwerp around 1560 and depicts various scenes from the life of Jesus Christ, including the events of Easter Week, Christ’s death, and his childhood. On the reverse side are scenes of Christ’s good works. 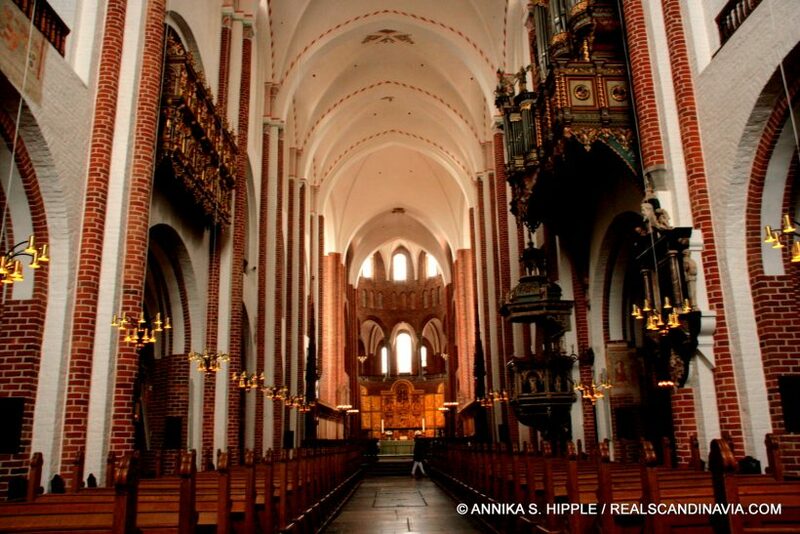 Roskilde Cathedral is worth visiting for its architectural value and the beauty of its interior, as well as for its historical significance. The cathedral has been the burial church for Danish royalty since the 15th century, with numerous side chapels and porches added on over the years. Among those who have found their final resting place at Roskilde is Queen Margrethe I (known as Margareta I in Sweden), the founder of the Kalmar Union, which united all three Scandinavian countries under one ruler for more than a century from 1397 to 1523. 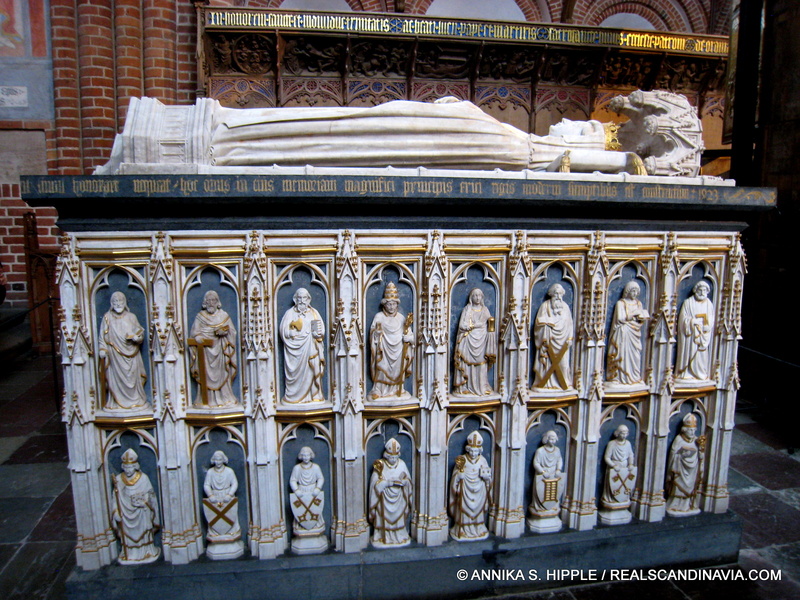 Margrethe died in 1412 and is entombed in a sarcophagus behind the altarpiece. One of the most interesting side chapels is the Chapel of the Magi, also known as Christian I’s Chapel, adjacent to the cathedral entrance. Built in the second half of the 15th century, the chapel holds the magnificent Renaissance tombs of Christian III (died 1559) and Frederik II (died 1588). The chapel’s founder, Christian I, died in 1481 and is buried in a small chamber under the floor alongside his queen, Dorothea. A pillar in the center of the chapel carries markings indicating the heights of royal visitors, including the current queen, Margrethe II, as a princess (182 cm), Chulalongkorn of Thailand (165.4 cm), and Peter the Great of Russia (208.4 cm). 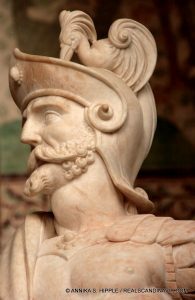 Even after more than 500 years, no one has come close to equaling the height of Christian I himself, who apparently towered 219.5 cm (over 7 feet 2 inches) in height. A dozen royal family members – including kings Frederik V, Christian VI, Frederik VII, Christian VII, and Christian VIII, are buried in Frederik V’s Chapel, designed in 1789. On the north side of the cathedral is Christian IV’s Chapel, dating from approximately 1620, although the interior work was not completed until as late as 1866. Look for the signature of the king’s master smith at the bottom of the iron entrance doors: “Caspar Finke bin ich bennant. Dieser Arbeit bin ich bekannt” (“Caspar Finke is my name. To this work I owe my fame”). 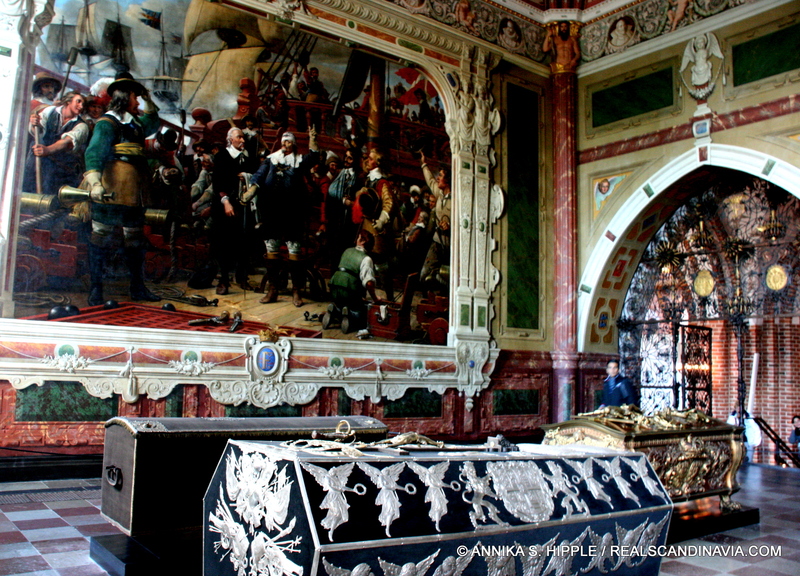 Paintings in the chapel include Vilhelm Marstrand’s enormous depiction of a famous scene of the king on the ship Trefoldighet (Trinity) after being wounded in a sea battle off the island of Sehmern. Christian IV died in 1648 after being on the throne for just six weeks shy of 60 years, the longest reign of any Danish monarch. His chapel contains his coffin as well as those of his first wife, Anne Catherine of Brandenburg (died 1612); his eldest son, the heir apparent Christian (died 1647); his second son, who became King Frederik III (died 1670); and Frederik’s consort, Sophie Amalie of Brunswick-Lüneberg (died 1685). Roskilde Cathedral also contains numerous other chapels, including Trolle’s Chapel, notable for the distinctive troll figure in its wrought-iron grating – a play on the name of Niels Trolle, a prominent vassal of of Christian IV, who in 1644 was granted use of the 15th-century chapel as a burial vault for his family. Most recently, in 1985, a special tomb was constructed outside the cathedral, to the northeast of the building, for King Frederik IX, who had died in 1972. His wife Queen Ingrid was buried with him upon her death in 2000. In April 2018, an unusual sarcophagus of glass and silver was completed for Denmark’s current queen, Margrethe II, in St. Birgitta’s Chapel. Although photographs were released to the public, the tomb has been covered up and will not be unveiled again until after Margrethe’s death. Roskilde Cathedral was designated a UNESCO World Heritage Site in 1995. Originally published on 21 February 2013. Latest update: 17 January 2019. 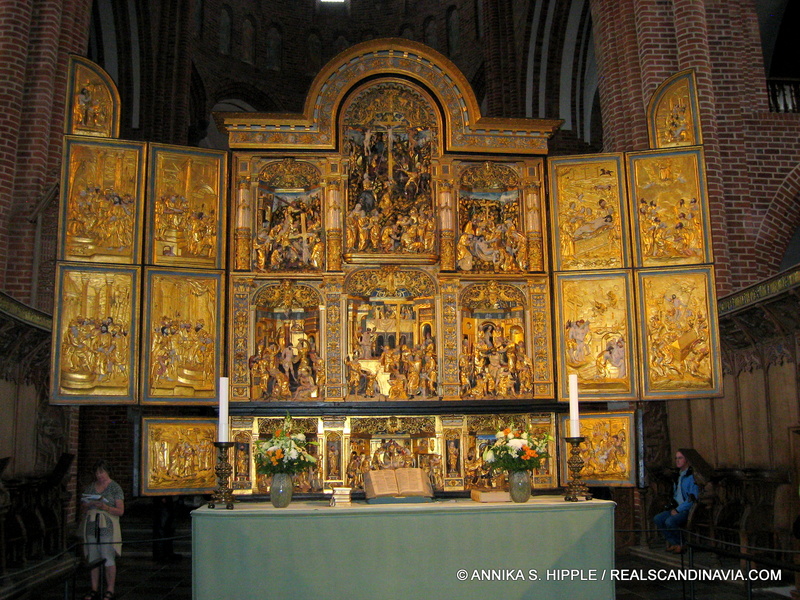 I would really love to visit Roskilde Cathedral one day. (My hometown, is Gainsborough, in Lincolnshire, England). I have always been very interested and proud of ‘our’ Viking ancestors when I first heard about them coming to my town after they sailed down the River Trent. One reason for my visit would be to wander the countryside where King Sweyne and King Canute both grew up. Hi Glen, thanks for commenting. The historical connections between Scandinavia and the British Isles are really fascinating. I was just reading the other day about the many linguistic traces the Vikings left in British place names. If you do visit Denmark, definitely don’t miss Roskilde — not just the Cathedral, which is wonderful, but also the Viking Ship Museum nearby. I wrote about it in another article (http://realscandinavia.com/on-the-viking-trail-through-scandinavia/) along with other Viking-related places in Denmark and other parts of the region. One of these days I’m going to do an article about Viking-related places outside Scandinavia. I haven’t been to Lincolnshire, but I was in York a few years ago and really enjoyed learning about the Viking history in that area. Thanks for your work here! I had heard that the Roskilde Cathedral still sounds a bell (or chimes?) twice a day in remembrance of Queen Margrethe I. Is this true, and, if so, do you happen to know the times of the day when they bells (or chimes) are sounded? Many thanks again for sharing the rich culture of Scandinavia with us! Thank you for your kind words, and for reading. As to your question about bells being rung in remembrance of Margrethe I, I did find one reference to this online, but I question the reliability of the source (an online encyclopedia page with only a few sources cited). 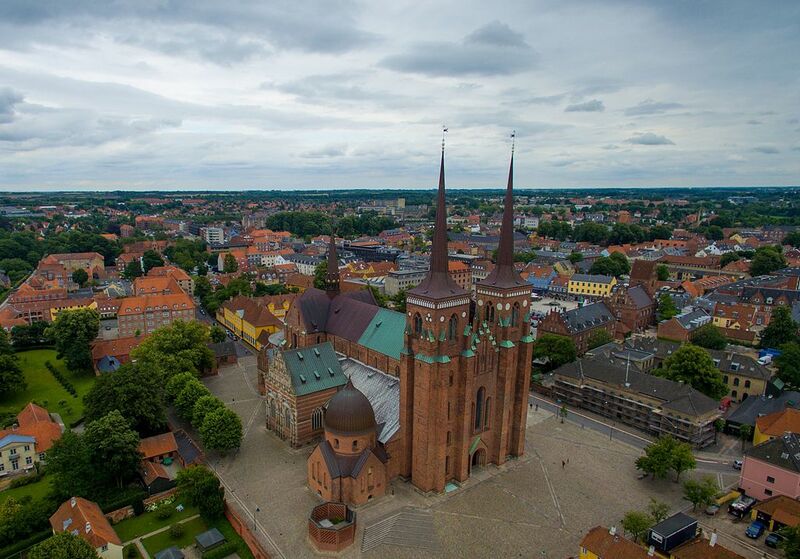 I’ve visited Roskilde Cathedral several times (though it’s been about five years since my last visit), and no guide has ever mentioned bells being rung for Margrethe I. Nor could I find any reference to this on the cathedral’s website in either English or Danish, or in a detailed official cathedral booklet I have. If I learn anything different, I’ll be sure to post another reply here, but it seems to me that if the bells were indeed being rung twice a day in memory of Margrethe I, the cathedral’s website and publications would mention it. The website did mention that the bells are rung several times a day (the ones in the south tower at 8 a.m. and 12 noon, and the ones in the Margrethe Spire at 10 a.m., 3 p.m., 5 p.m., and 7 p.m.). However, this is considered a continuation of the old medieval tradition of bell ringing to signal the start of various religious services, and by extension, indicating the time of day to the townspeople, who generally did not own clocks. The information (and timeliness of the response) is most appreciated! My wife and I were in Copenhagen last summer and may well be back in 2018. If so, we did plan on visiting Roskilde and other surrounding sites as they appear to be in rather easy striking distance by rail hence part of my interest in Queen Margrethe and the cathedral. I appreciate too your effort in sharing the region’s rich culture and history with us all as it is as excellent as it is appreciated (and I know how much time and effort is involved too)! Tack så mycket from central Pennsylvania in the States!